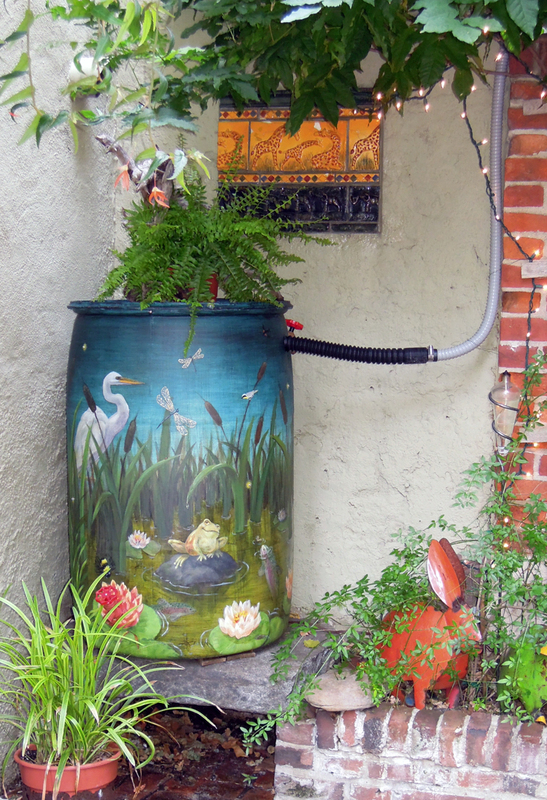 You might never imagine a rain barrel as public art, but that’s exactly what Rittenhouse neighbors Karen Villareal and Pat Harner have created. Their fly fishing-inspired rain barrel recently won first prize in Plow & Hearth’s Water Colors Contest—a competition designed to raise awareness on water conservation by challenging contestants to paint rain barrels and watering cans. When Harner first received her rain barrel from the City of Philadelphia, she wasn’t so happy about the “recycle-blue” color. So, she asked Villareal, her neighbor and an artist, if she would paint the barrel. Soon the project became a community event. Another neighbor volunteered a downspout in a better location and children in the neighborhood prepared the barrel for painting. The barrel’s design is inspired by a love for fly fishing and the knowledge that fish and other aquatic animals only survive in clean, unpolluted water. In addition to paint, glass beads are used on the barrel to simulate fireflies. For winning, Plow & Hearth donated $5,000 to American Rivers, a leading river conservation organization, and awarded Villareal and Harner a $1,000 gift certificate. For more details about the Water Colors Contest, including all the award-winning rain barrels, visit Plow and Hearth’s website.